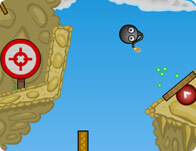 Run, jump, dodge, collect coins and survive your way through the levels in this action packed game. Note: Double tap the up arrow key to jump higher once you get the upgrade. It's simple Enemies, bits, bombs, and robots are out to get you, how long can you survive? Toss Alien babies backpacks into the air, time them to land on other babies for points and cruel fun. Throw the seal as high as possible and post your records in comments.